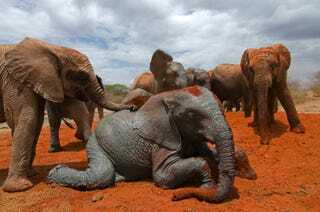 WE'RE ALL WE'VE GOT | Orphaned elephants pour red dust over each other's bodies to protect against the sun and insects, at the David Sheldrick Wildlife Trust centre in Tsavo East national park, Kenya. Photo by Barcroft Media, via Guardian. Thanks to Alex Ogle.